Mix flour, salt, sugar, and shortening with a mixer fitted with the paddle attachment. Place 1 egg yolk in a measuring cup then fill with milk until you have 2/3 cup total then blend. Add to flour and shortening; mix for 1 minute. Roll out 1/2 of the dough for the bottom crust on a pastry mat or on a piece of saran wrap. Place in jelly-roll pan; be sure to have crust up the sides of the pan. Mix sliced apples, sugar and cinnamon together; spread over bottom of crust. Roll out other 1/2 of dough and place over apples. Prick with fork and brush with egg white. Bake at 325 for 45 - 50 minutes or until starts to brown. Make glaze by mixing 1 cup powder sugar and 1 1/2 - 2 tablespoons lemon juice. 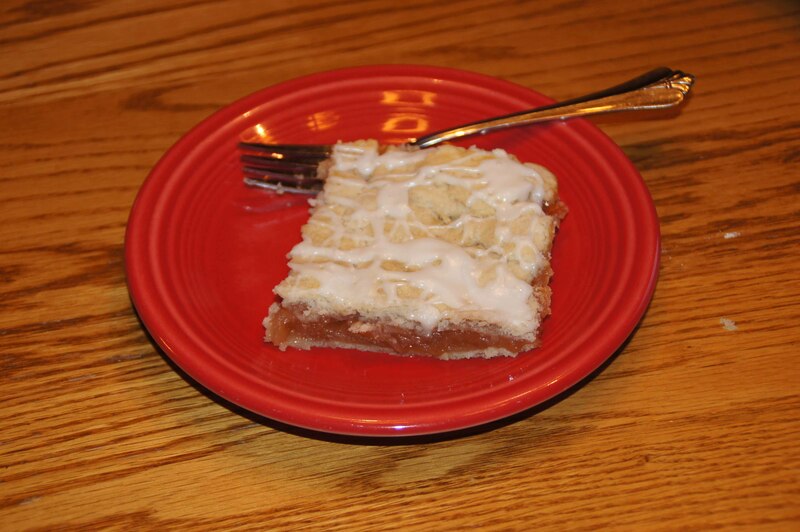 Drizzle over warm apple pie bars.